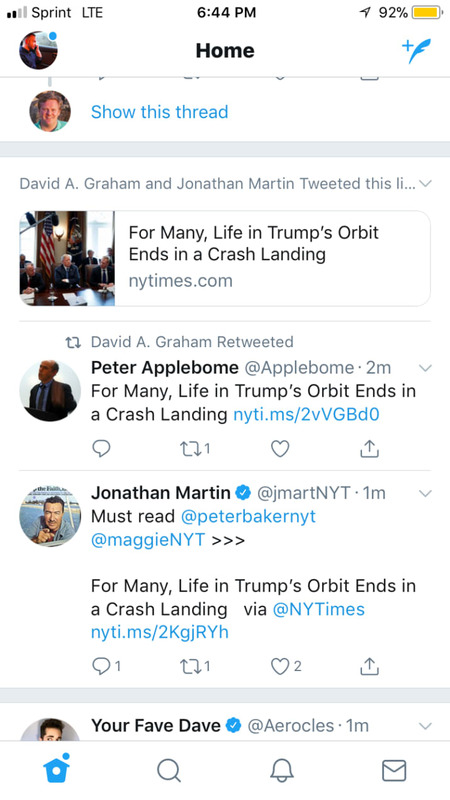 Twitter has updated the way its main timeline treats trending news stories, so that tweets from users linking the same story get grouped together (via BuzzFeed). The change means users will now see a banner at the top of their feed that lists links to a particular story from people they follow, and should prevent users from seeing multiple shared links to the same story in their timeline. The update represents the latest move in an ongoing strategy to make the social media platform more news-centric, with recent experiments focusing on algorithmically curated timelines for major events, combining news reports with tweets by the public. Twitter has also been testing a "camera-first" feature that's designed to put more emphasis on video and images. The feature combines location-based photos and videos with Twitter Moments around notable events, with companies able to sponsor events or put ads between tweets. Twitter already shows live news broadcasts in a live-streaming window next to its timeline during major breaking news events. In 2016, the app also got moved to the News category in the App Store to highlight the change in direction for the company. One of many reasons I use Tweetbot. No BS to sift through. I know this is hard to get into the skills of marketing folks at Facebook and Twitter, but I want posts to appear in reverse-chronological order no matter what. I don’t want “here’s what you missed”, I don’t want it to “cleverly” filter stuff out, I don’t want grouping. I don’t want “trends”. I don’t want “the best tweets first”. I don’t want “personalization”.